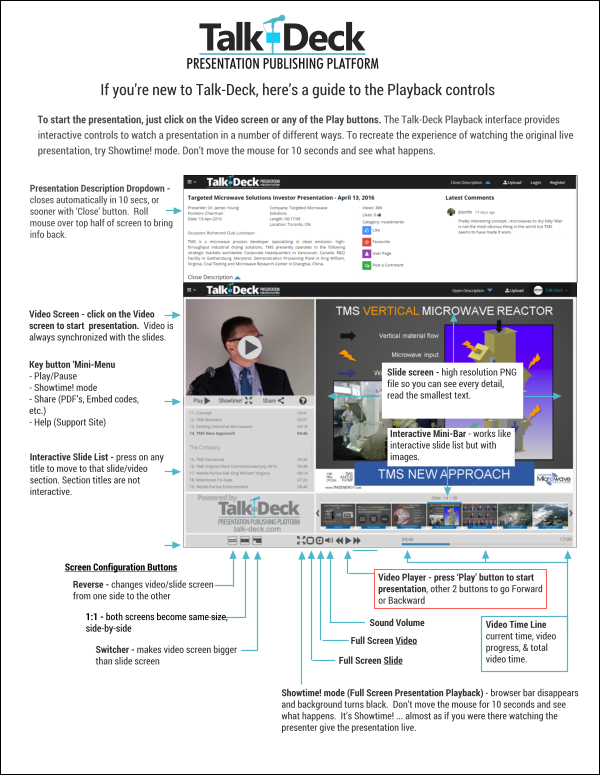 A Talk-Deck replicates online the experience of watching a presenter deliver a presentation live, with the added benefit of precise interactivity that puts you in control of your viewing experience. A small video screen contains a video of the presenter delivering the presentation. A large slide screen displays the speaker support slides that accompanied the presenter. Interactive controls let you access any part of the presentation you want instantly: you can skip some parts, watch other parts again and again. Here are the main features of the Talk-Deck Playback screen. Start/Stop a Talk-Deck by pressing the “Play Video” button. The presenter (video) stays perfectly synchronized to the presenter’s slides, just like in a live presentation. Below the video screen is a list of “Slide and Section Titles”. Click on any slide title to go instantly to that slide and point in the presentation. Video and slides stay perfectly synchronized. Below the large current slide image is the “Mini-slide Bar”. This provides the same control as the slide list using images instead of text links. Click on any mini-slide to go instantly to that slide and point in the presentation. Below the Mini-slide Bar is a “Video Timeline” that will take you to any part of the presentation by time when you click on it. The bottom “Icon Bar” contains a number of icons that enable you to change screen configurations, provide sharing functions, and more. Roll over any icon to discover its function. If you want to make your own Talk-Deck presentation, just go to talk-deck.com and press “Create a Talk-Deck”. Here’s a pictorial guide to all the elements of the playback screen. View as is or click on the image to link to a full size PDF.